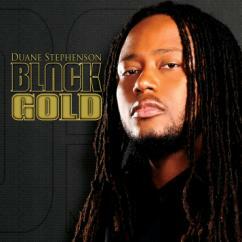 VP Records is set to release singer/songwriter, Duane Stephenson’s sophomore release, BLACK GOLD, on September 28, 2010. The 14-track CD sees Stephenson working with legendary reggae sax player Dean Fraser, who provided the majority of production on BLACK GOLD. Journeying through this album you can’t escape from being drawn in by the smooth vocals and harmonious instrumentation. A perfect example of this is the track “When We Rise” featuring Ras Shiloh produced by Kemar “Flava” McGregor. Duane Stephenson offers an urgent plea to break the repetitive violence plaguing Jamaica on “Cycle Goes On.” On the first single “Sufferer’s Heights,” Duane sings of the struggles that many people are facing during these recessive times. Stephenson presents various styles and influences on BLACK GOLD. He adds a lovers rock flavor to Larry Duane Addison’s mid 80s pop-soul lament “Members Only.” Stephenson and the soulful Gramps Morgan compete for a woman’s affection on the country-tinged track “Rescue Me.” Avideo wll accompany this track; shooting begins in New York on September 7th. From ballads to roots reggae, his musical skill and heartfelt sentiments will resonant with reggae fans and gain him new ones with BLACK GOLD.